If you read my Space NK Haul post you'll know I went a little bit crazy for the Rococo nail polishes on offer. Now I really don't need anymore polishes but with these beauties being reduced from £12 to £3.. can you really blame me? 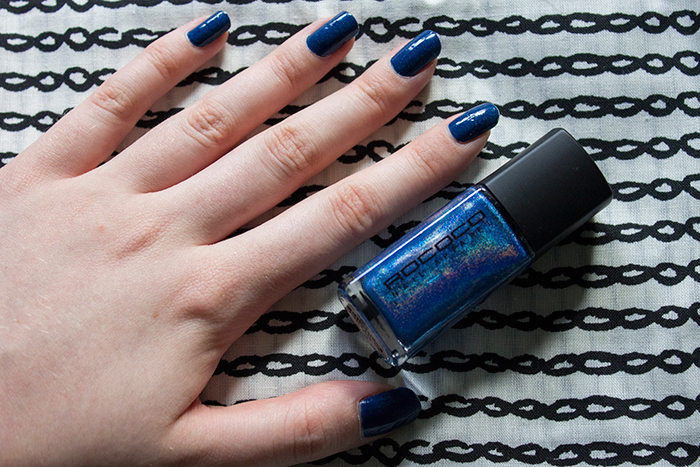 I couldn't wait to try out the shades so first up we have the Rococo Indie Luxe Nail Apparel. From the bottle you can see Indie Luxe is a gorgeous shimmery deep blue shade but on the nails.. this doesn't really show through all that much. The shimmer is much more subtle which makes it more of an additional feature rather than the main aspect of the polish itself. Colour aside, this applies beautifully. Rococo polishes have a very watery consistency which makes them really easy to blend out and the drying time takes no time at all. I was happy to see this feature in this polish compared with shades I've previously tried. Longevity wise, it wasn't really all that great. I found that it started to chip around the edges after a few days wear and even after a sneaky little top up, still chipped straight after. Ironically it was pretty much impossible to remove and stained my nails a little so it's definitely in need of a base coat. Overall, I was a little underwhelmed with this polish, but for £3 i'm not too hurt by it. If I'd have paid full price I'd definitely be more disappointed. Onto the next one!